LAS VEGAS – Sometimes the calf roping gods strike down their thunder with vengeance, which happens throughout the course of any rodeo season. For Tyson Durfey, it happened during ProRodeo’s season-ending championship, the 2010 Wrangler National Finals Rodeo. For the Missouri-born tie down roper, it made for a tough 10 days in the Nevada desert, and the frustration was compounded by the fact that he’d had the best regular season of his young ProRodeo career. Through the first nine go-rounds of the NFR, Durfey had placed just once, a tie for third place in the seventh go-round, worth $8,897. But his final run of a long stay in Las Vegas was worth $16,947, when he posted a quick 7.5-second run to tie for fourth place in the final round. It also helped him finish sixth in the all-important average race. 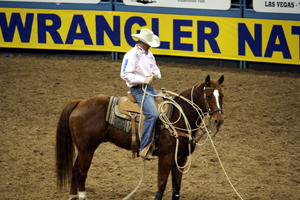 Durfey was one of just nine cowboys to rope and tie down all 10 calves, and his cumulative time of 107.9 seconds was sixth best in the aggregate race. That, in itself, is a testament to Durfey’s solid conditioning and work ethic. In all, Durfey earned $25,844 during his frustrating run in Las Vegas, which helped take the edge off things. It was the fourth straight year Durfey, 27, of Colbert, Wash., had qualified for the NFR. While he had a nice rally to finish well, it was quite a different story from 2009, when he earned about $85,000 in the finale. None of it, however, will derail Durfey from conducting business the best way possible. He is the first cowboy from the United States to win a Canadian championship in 2006, and he did it a second time two years later. He knows that it takes to win titles, and the first step is returning to the NFR for the fifth straight year next December.